Live streaming is one of the most widely used communication tools today. Organizations small and large are utilize live streaming services to stream content to their audience. There are many platforms a user can use to show videos to his/her users such as Twitch, YouTube and Vimeo. Today we have the capability of taking this popular video presentation a step further by live streaming events to the world and having those event then converted into replayable videos. Today all of the top churches utilize live streaming to spread the good word across the world and people who cannot attend the church sessions on Sunday can just tune in to the live stream from any computer with a internet connection. 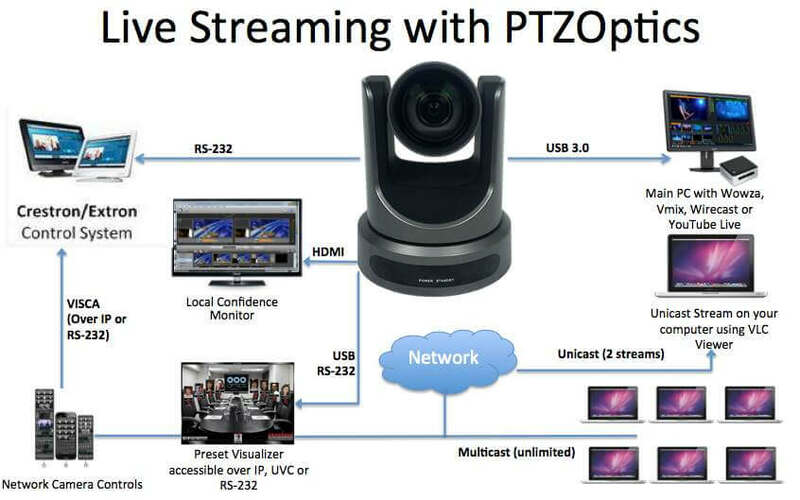 Today we want to address the various ways you can do live streaming with PTZOptics cameras. With the PTZOptics camera line you can actually take advantage of IP Streaming with simultaneous HD-SDI, HDMI and other video outputs such as USB 3.0 and CVBS. Let’s take the example above (PTZOptics 20X-SDI) to show that two IP Streams and a HDMI output are all being sent simultaneously. The beauty of IP streaming with PTZOptics is that you also get IP control. That means you can control the camera with any computer on your network (and even use our new PresetVisualizer). Let’s take a look at a couple different scenarios. This is used for internal viewing of your IP Camera Stream. You can view it with a software like VLC or a IP decoder. You can even use VLC to accept a stream and rebroadcast a new IP stream at the same time. PTZOptics cameras natively only support up to (2) 1080p video streams or (1) 1080p and (1) lower resolution stream. 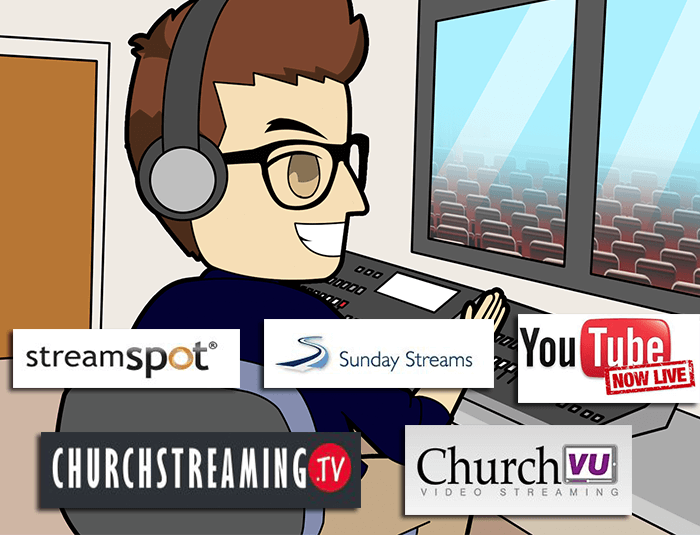 RTSP streams are popular for live streaming applications such as ChurchStreaming.TV, Wirecast, Wowza and VMix. You can easily send a RTPS stream to these services will accept the stream as a input into your live video production. PTZOptics cameras can embed audio into this stream making it a easy way to get video and audio into your live streaming production. RTMP streaming is also popular for live streaming applications like Wowza, Telestream, Wirecast and VMix. You can also send RTMP streams directly from any PTZOptics camera which can be accepted as a video input in your live stream. We are now seeing some of the first video mixers built for live streaming such as the Epiphan Pearl. This device will also accept HDMI and HD-SDI inputs, provide video mixing and then send out a mixed RTSP or RTMP stream. Products like the Epiphan Pearl provide amazing flexibility “pre-stream” and integrate with streaming services and CMS / LMS solutions like Blackboard, Moodle and more. Nowadays you can do a lot with a USB connection to your computer. Programs like YouTube Live and Google Hangouts on Air provide FREE live streaming capabilities with a USB camera and microphone. Today PTZOptics can provide both video and control over USB making USB an ideal connection that can save a lot on installation time and cabling requirements. Andy Chatfield is testing every option for YouTube Live streaming with the PTZOptics cameras. So far he has tested: Google Hanouts on Air, Flash Media Encoder and now Wirecast. In this three part video series you will see just how easy it is to stream to YouTube Live. Andy set’s up his YouTube Live event and sets up his Wirecast streaming information in just minutes in the video below. Soon to come Andy will be showing YouTube Live streaming with Wirecast using RTSP and RTMP video streams over the network. But in this video Andy is using a USB connection to his windows computer and then using Wirecast media encoder to stream directly to YouTube Live.